North Geelong Warriors celebrated 45 years since the club was founded in 1967 and twenty years since their unprecedented and unequalled victory in the Victorian Premier League in 1992. North remains the only club ever to win the VPL in its first season after being promoted from the State League First Division. Many of the members of that team and coach Branko Culina joined a large gathering of the club’s supporters, players and sponsors at a function in the clubrooms at Elcho Park, Lara on Saturday night. On Sunday some of the survivors of the 1992 team showed glimpses of their talent in a match against an elite squad that included Socceroo Josip Skoko and Croatian international keeper Joey Didulica. That was the second miracle since the celebrations on the Saturday went on well into the night! Les Murray of SBS and the ABC’s Francis Leach acted as masters of ceremonies, while Francis Awaratife, who played ten games for North during that stellar season in 1992, was also present. Branko Culina was asked if he could explain why the Croatian sides and North Geelong in particular have been such a nursery of international players for Australia and Croatia. Like many others he found this hard to pin down, though he pointed to the fierce determination to win that was instilled in players from an early age and the tremendous support that the club received from its community. He recounted the contribution that the club had made to his career as a coach and brought the house down when he admitted that he had been perceived as arrogant when he was making his way as a leader in the game, but that ‘he was no longer arrogant’. Late in the evening I watched a number of youngsters out on the field practising their skills under the club’s floodlights. They had badgered a club official to put the lights on so they could do so. It seemed to me that this was another indication of why the club produces generations of players and reminded me of the games in Scotland in my youth. They began with a few of us after school on the village pitch and were still going at nearly midnight in the Scottish summer with sometimes over a hundred players taking part. No coaches or teachers in those days, just a chance to learn how to find and keep the ball for a few seconds or more as the skills and resilience were learned. Long time club president and father of the Socceroo skipper of the same name, Steve Horvat talked about the club’s role in the local community, while the founding group of officials were recognised by the presentation of replica shirts. His present day successor Daniel Desa introduced Pejo Maric to recount the history of the club, while I added some stories and pictures to round out that part of the evening’s activities. It was marvelous to see the camaraderie that was picked up instantaneously by the players in particular many of whom had not had many chances to meet each other since they left the club all those years ago. 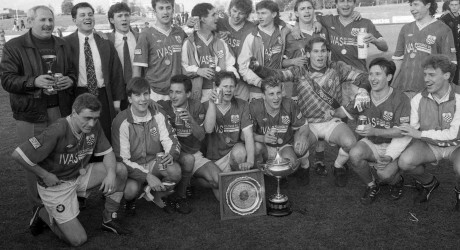 North Geelong with the Victorian Premier League trophies in 1992. Back row, left to right. Steve Horvat, senior, Joe Madunic, Frank Simovic, Steve Horvat, junior, Vinko Saric, Robbie Cosic, Goran Georgievski, Joe Markovac, Robbie Markovac, Adrian Cervinski. Front row: Bogdan Bonk, Slavko Banozic, George Karkaletsis, David Cervinski, Eddie Kuzman, Marijan Vunderl, Mark Wilson, Robert Palmaricciotti. Photo: John Punshon.